Endoscopic ultrasonography (EUS) is a useful modality for imaging of the blood vessels of the mediastinum and abdomen. The important vessels in EUS imaging include the aorta and its branches (the great vessels of neck, mesenteric arteries), superior and inferior vena cava, azygos vein (AV) and vessels related to portal venous system. ,,,,, Computed tomography scan or magnetic resonance imaging are the usual methods for detection of abnormalities in aortic disease. ,,,,,, Aorta acts as an important home base during EUS imaging. 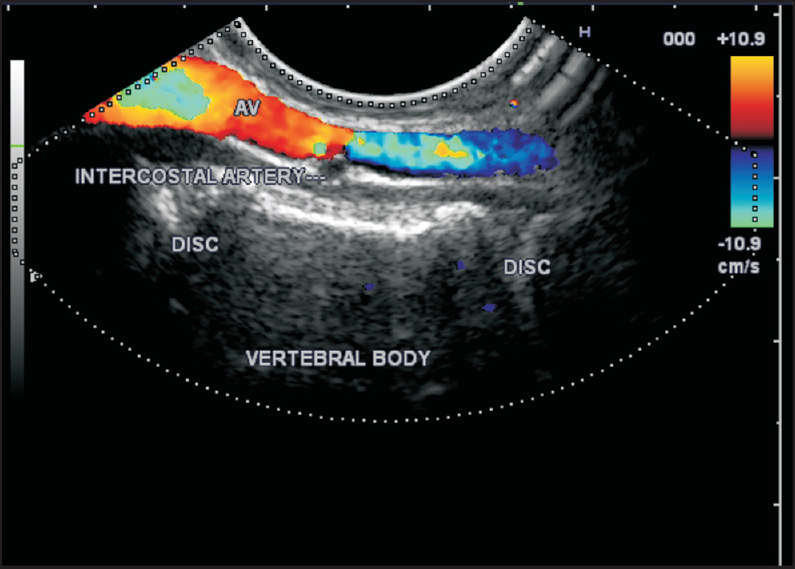 EUS imaging also provides a unique opportunity to evaluate the aorta and its branches as well as certain congenital aortic anomalies. 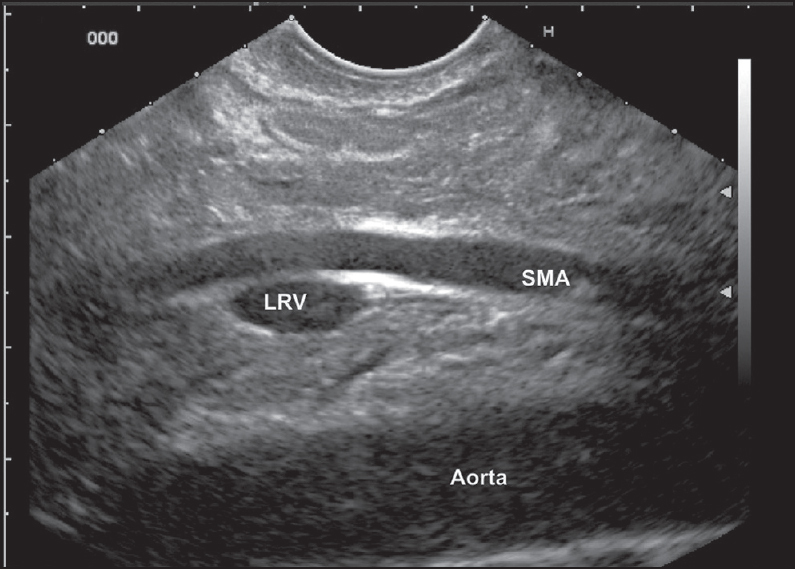 , Conventional abdominal sonography can evaluate the abdominal aorta or its branches, but it is usually difficult to evaluate the thoracic part of the aorta. The evaluation of the aorta and its branches may be helpful in the assessment of diseases primarily involving the aorta or its branches, for assessment of invasion of the thoracic aorta in mediastinum and evaluation and staging of pancreaticobiliary malignancies. 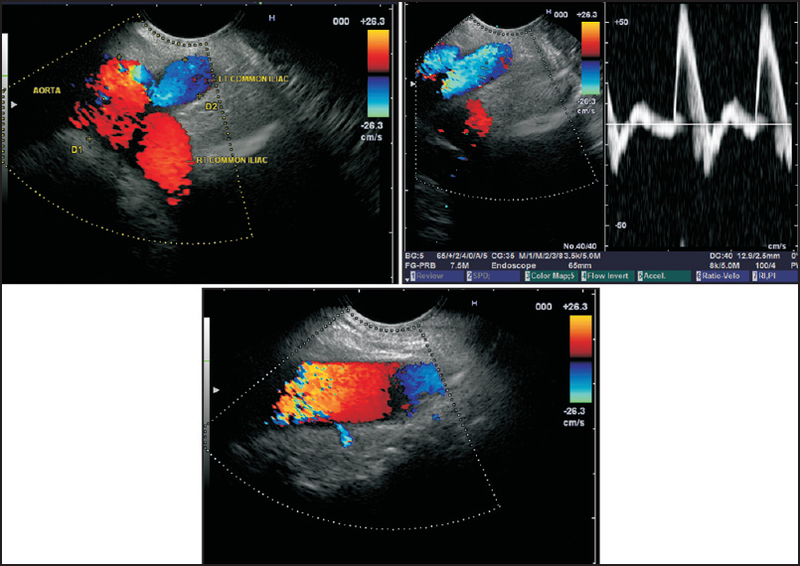 The aorta and its branches are accessible by standard angiographic methods, but endosonography guided access can provide an alternative method for diagnostic and therapeutic interventions. 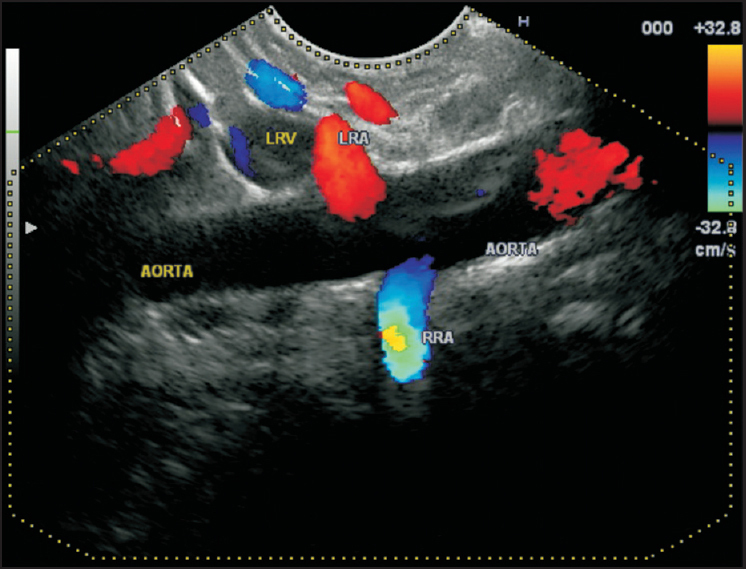 This article describes the techniques of imaging of different part of the aorta by EUS. 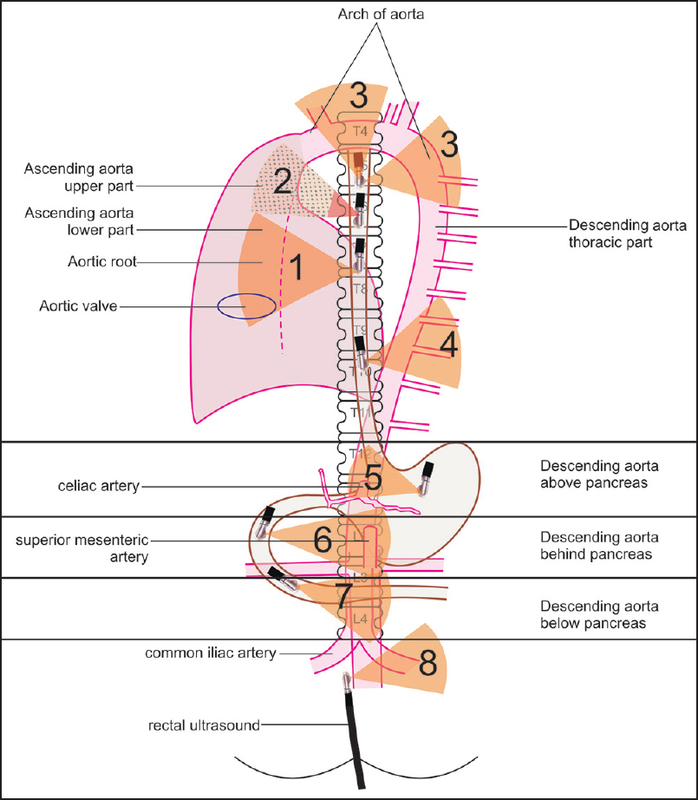 The imaging of most of the aorta can be done from its origin from the heart to the point of bifurcation at the L-4 vertebra from the following positions [Table 1], [Figure 1]. The aortic root has a diameter of 2.4-4.7 cm (its diameter is more in males than females) and lies at the base of the left ventricle posterior to the right ventricular outflow tract. The aortic annulus, which lies at the base of the aortic root, provides attachment to three semilunar cusps (one anterior and two posterior) ,,, [Figure 2]a. Distal to the attachment of the cusps the aorta is wide and presents three dilatations which are called the aortic sinuses of Valsalva, (right coronary - anterior, left coronary - left posterior and noncoronary - right posterior) [Figure 2]b. From the aortic root, the ascending aorta passes upwards, forwards and to the right to continue as the arch at the level of upper border of the right second costal cartilage (sternal angle, lower border of the T4 vertebra). 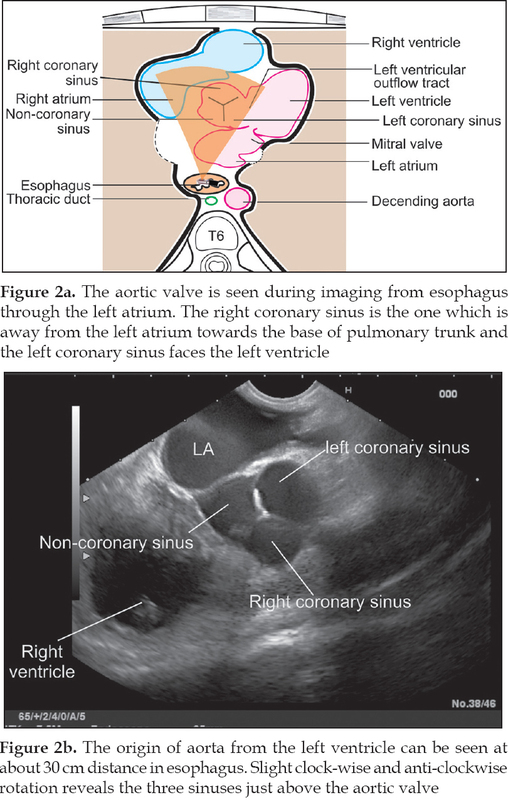 It ascends anterior to the left atrium, right pulmonary artery and right principal bronchus, and posterior to the right ventricular outflow tract and beginning of the pulmonary trunk [Figure 3], [Video 1]. Identify the left atrium and right pulmonary artery. The left atrium is identified as the largest pulsatile chamber at about 30 cm in the anterior wall of the esophagus. The right pulmonary artery is seen above the left atrium. Identify the root of the aorta. 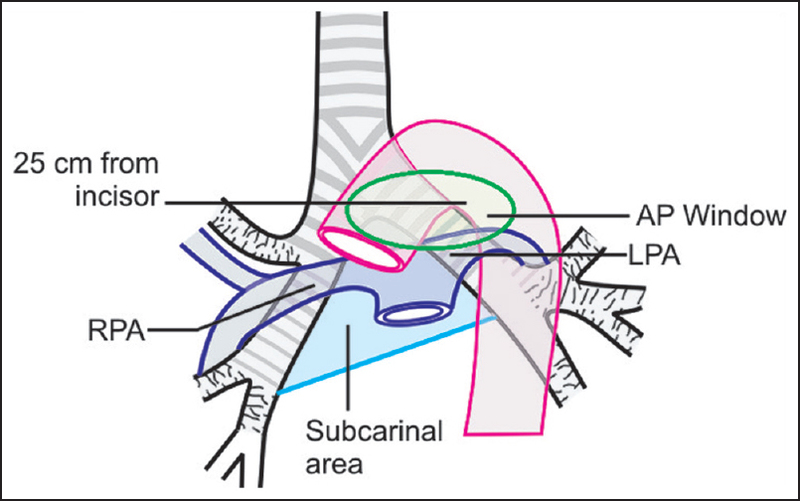 The root of aorta is identified anteriorly to the upper part of the left atrium or right pulmonary artery [Figure 4]. 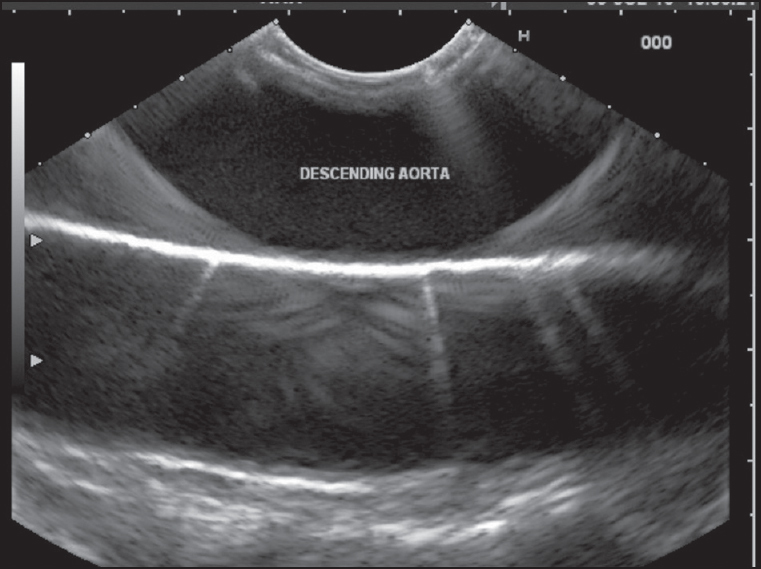 Rotation of the scope is able to identify the individual leaflets of the aortic valve. The origin of both coronary arteries can be visualized in this position. Trace the ascending aorta from the aortic valve. The ascending aorta is identified as a long tubular structure going up for a distance of about 5 cm from the aortic valve [Videos 2 and 3]. 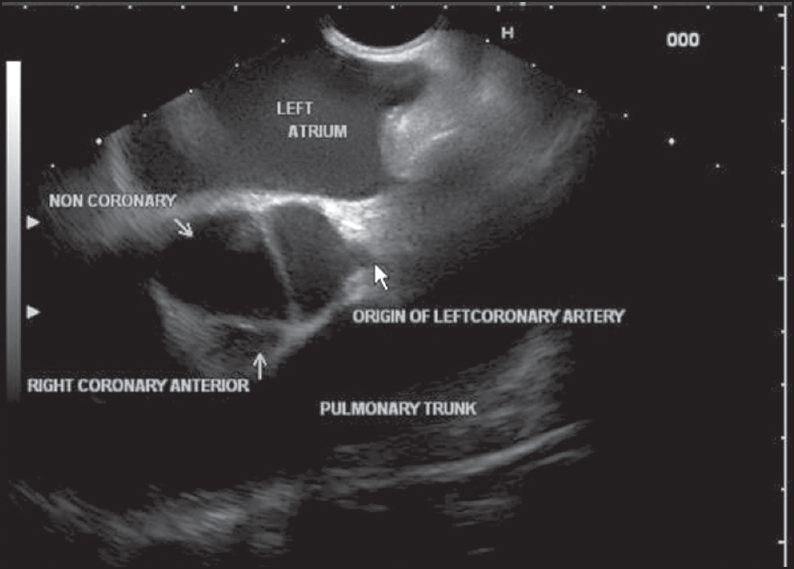 The right coronary artery arises from the right (anterior) sinus of Valsalva and the left coronary artery arises from the left (left posterior) sinus of Valsalva [Figure 5] and [Figure 6], [Video 4]. 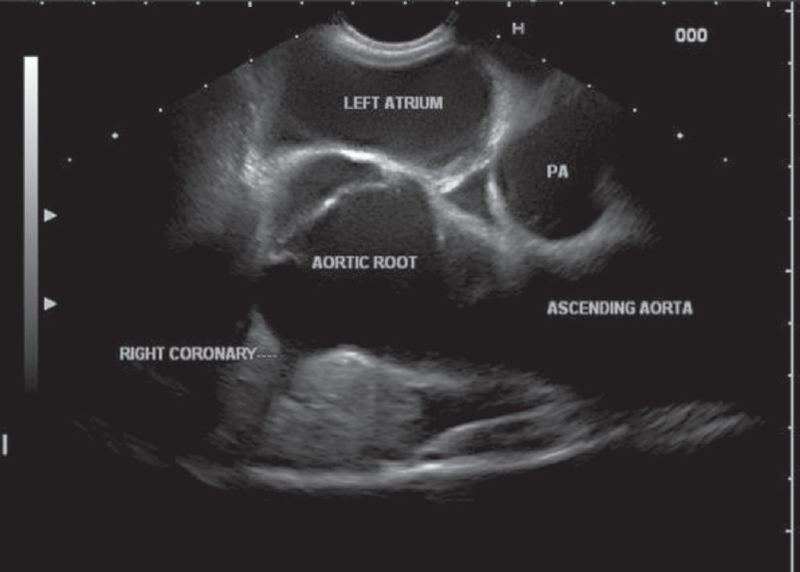 The left coronary artery is followed-up easily for a distance of about 1-2 cm from its origin on EUS [Figure 7]. This part lies at about 25-22 cm distance in the anterior wall of the esophagus. The imaging of the uppermost part of the ascending aorta, the origin of the brachiocephalic trunk (BCT) and some part of the arch of the aorta is not possible (blind area of imaging) as the trachea and part of the left bronchus comes to lie between the esophagus and ascending part of the aorta. This part of the aorta has no branches [Figure 8]. The aortic arch begins as a continuation of the ascending aorta at the level of the upper border of the right sternocostal joint. Its diameter ranges from 0.9 to 2.5 cm. It ascends slightly to the left across the anterior surface of the trachea, arches over the root of the left lung and then descends on the left side of the trachea and T4 vertebra to continue as the descending thoracic aorta [Figure 8]. 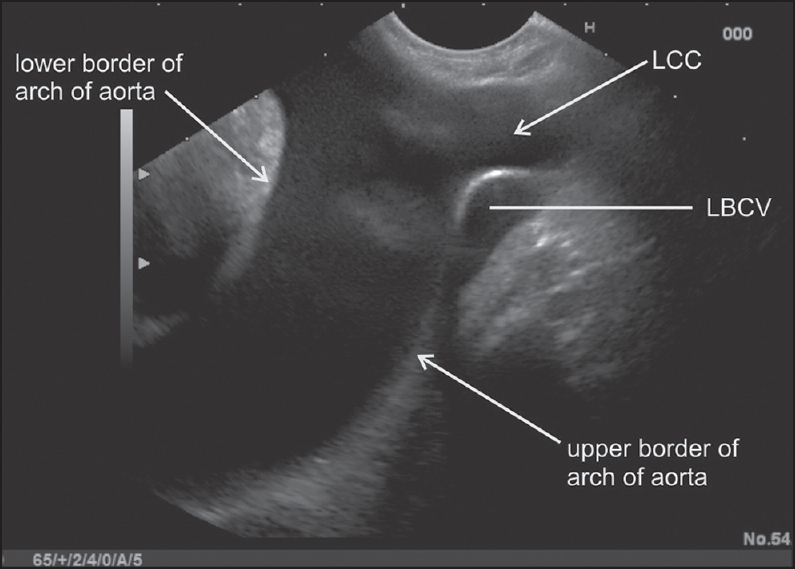 The lower border of the arch forms an important boundary of the aortopulmonary (AP) window [Figure 9]. The beginning and ending of the arch are present at the same level of the sternal angle. 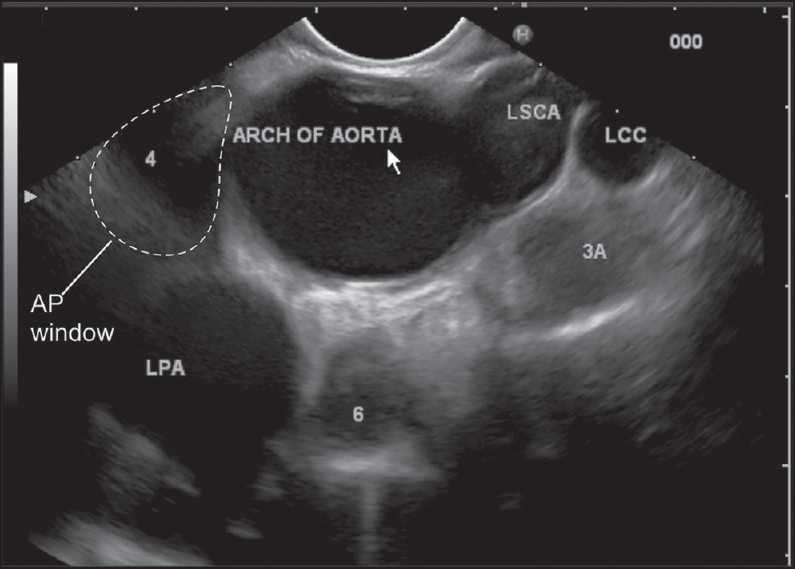 Initially, the aorta is located in a rounded position at 22 cm distance and the upper and lower borders are identified [Figure 10]. A rotation of EUS scope at this level is able to demonstrate most of the arch and its borders. The outer border presents as a convexity facing anteriorly and to the left and the inner border presents as a concavity facing posteriorly to the right [Figure 11]. From a rounded position, the entire arch can be traced by clockwise and anticlockwise rotation [Figure 11]. Tracing of the upper border of the arch finds the origin of great vessels of the neck and tracing the lower border of the arch identifies the AP window [Figure 9]. Imaging of AP window is possible either by focusing on the arch and descending aorta (DA) or by focusing on the pulmonary arteries. Follow the DA upward till it becomes the arch of the aorta. Turn clockwise with a slight push to see the AP window [Figure 12], [Video 5]. 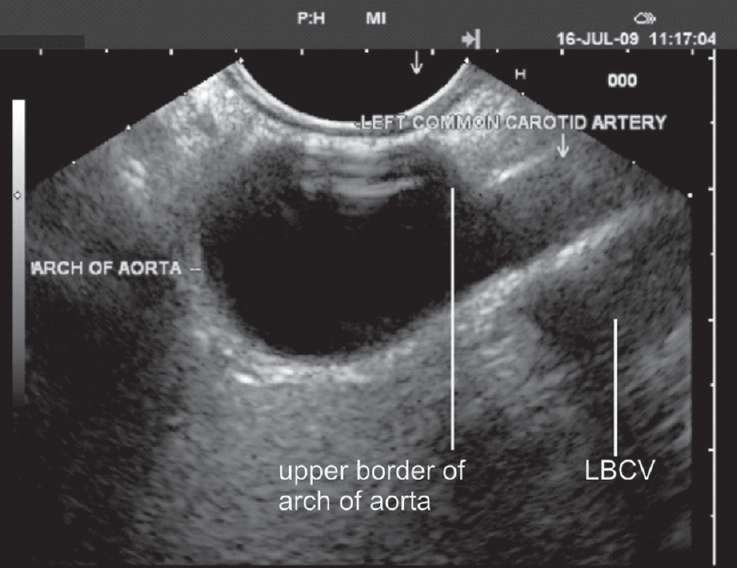 As an alternative method initially the arch of aorta is visualized. Slight pushing up with anticlockwise torque is needed to see the AP window [Figure 13]. Pull back the scope till you start seeing the right pulmonary artery. 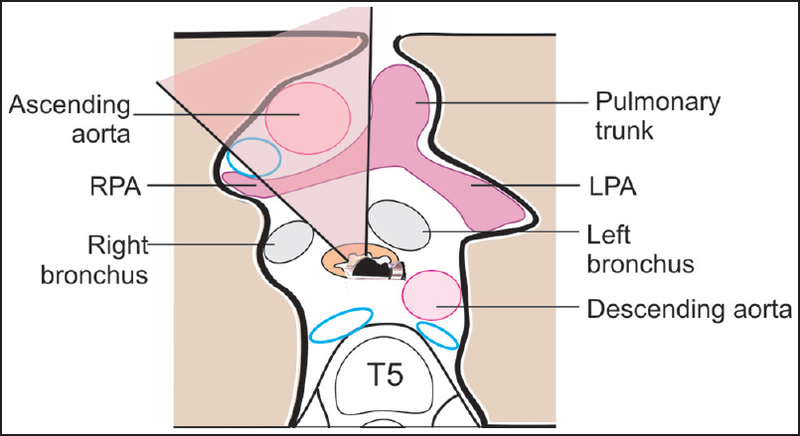 Continue slowly pulling back and once the tracheal rings start appearing on the cranial side, torque counter clockwise for about 90° and the AP window will be visualized [Figure 14]. 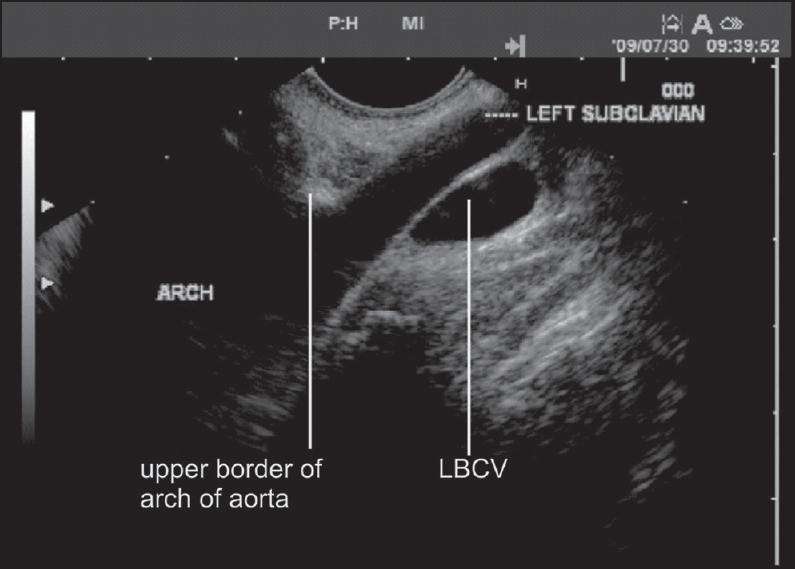 As an alternative method initially the left pulmonary artery is visualized through the lower part of the arch of the aorta. Clockwise rotation along with up tilt will reveal the AP window. Three branches arise from the convexity of the arch, the BCT, left common carotid artery and left subclavian artery [Figure 15] and [Figure 16]. All the three arteries are crossed anteriorly by the left brachiocephalic vein and can be seen while tracing the upper border of the arch of the aorta. The BCT usually lies in the blind area of imaging. [Video 6]. The imaging of the bronchial arteries is possible in the AP window [Figure 17]. The descending thoracic aorta extends from the level of lower border of the T4 vertebra to the aortic hiatus in the diaphragm in the midline at the level of lower border of the T12 vertebra where it continues as the abdominal aorta. It is about 16-18 cm in length and the diameter of its mid portion ranges from 1.6 to 3.7 cm. It lies in the posterior mediastinum, at first to the left of the vertebral column and then in front of the vertebral column. It descends successively posterior to the left pulmonary hilum and esophagus with which it is mutually spiralized to a limited extent and finally the diaphragm. It is fairly easy to trace the DA by pushing along the posterior wall of the esophagus from the arch downwards [Figure 18]. The origin of the intercostal arteries can be seen from the left and right borders of descending thoracic aorta on clockwise or anticlockwise rotation of the scope. The course of right intercostal arteries is more easily traced as they go across the spine after indenting the posterior border of the AV [Figure 19]. The left bronchial arteries can be sometimes traced in the AP window [Figure 17]. The DA in the abdominal part can be divided into three parts [Figure 20]. The first part extends from the aortic hiatus to the upper border of the pancreas and lies posterior to the omental bursa and is related anteriorly to the origin of the first major branch of the abdominal aorta, the celiac artery at the T-12/L-1 vertebral level. The second part lies posterior to the pancreas and is related anteriorly to the origin of the superior mesenteric artery (SMA) at the L-1/L-2 vertebral level. The third part (can be referred to as the infra renal part) extends from the lower border of the pancreas to the aortic bifurcation and is related anteriorly to the origin of the inferior mesenteric artery at the L-3 vertebral level. The abdominal aorta begins at the aortic opening of the diaphragm in the midline, at the level of the lower border of the T-12 vertebra and ends at the level of the lower border of the L-4 vertebra, slightly to the left of the midline, by dividing into two common iliac arteries. Its average length is about 10 cm and the diameter (1.7-2.3 cm) decreases from above downwards because of the origin of the large branches. a. Pushing the scope into the stomach follows down the thoracic aorta into the abdominal part. The thoracic aorta maintains a very close relationship to the esophagus but abdominal aorta goes away from the posterior wall of the stomach as the pancreas comes to lie between the aorta and stomach. The downward movement of the big wheel is usually required to follow the aorta. 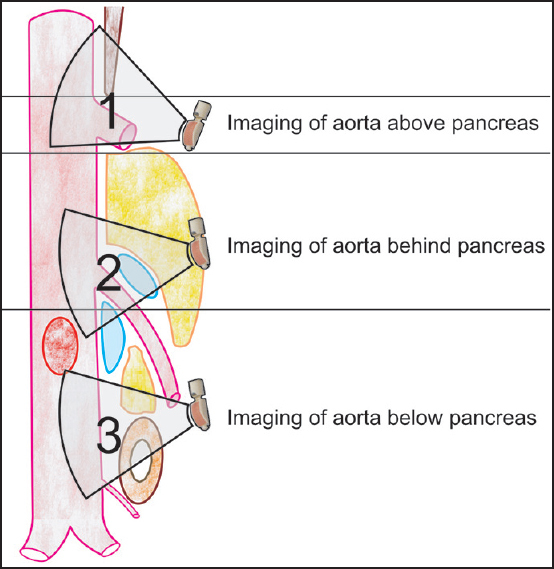 Following the thoracic aorta down and simultaneously moving the wheel down gives a sensation of climbing over a hill for an endosonographer akin to a car driver (in this case pancreas is the hill) [Figure 20]. b. The second way of imaging is by probing at the esophagogastric junction (40 cm) with the wheels of the scope in a neutral position and slight tipping up to maintain contact with the posterior wall of the stomach. c. The third way of imaging is by finding the liver during probing at 40 cm and 180° rotation to either side will locate the aorta. 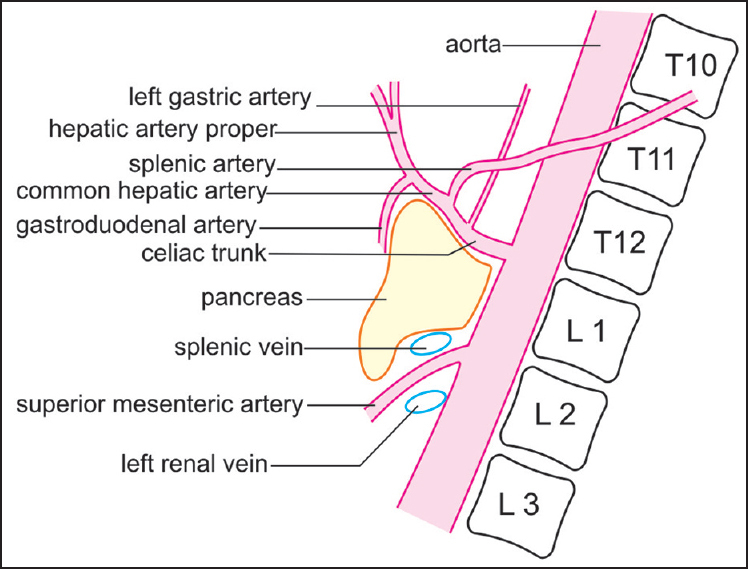 a. Celiac artery: The celiac artery is a short artery (length = 1.25 cm), which begins just below the median arcuate ligament where the left and right crura join and goes a little to the right side after taking origin from the aorta [Figure 21] and [Figure 22]. A counterclockwise rotation with slight torquing and simultaneously pushing down slightly locate the celiac artery. Torquing is required as the origin of the celiac artery is usually on one side of the aorta and without torquing the origin of the celiac artery may be missed. In general, more torquing than pushing is required and by torquing the trifurcation of artery into three, branches can be also identified [Figure 23] and [Figure 24], [Video 7]. b. Left inferior phrenic artery: The left inferior phrenic artery is located just above the origin of the celiac artery. 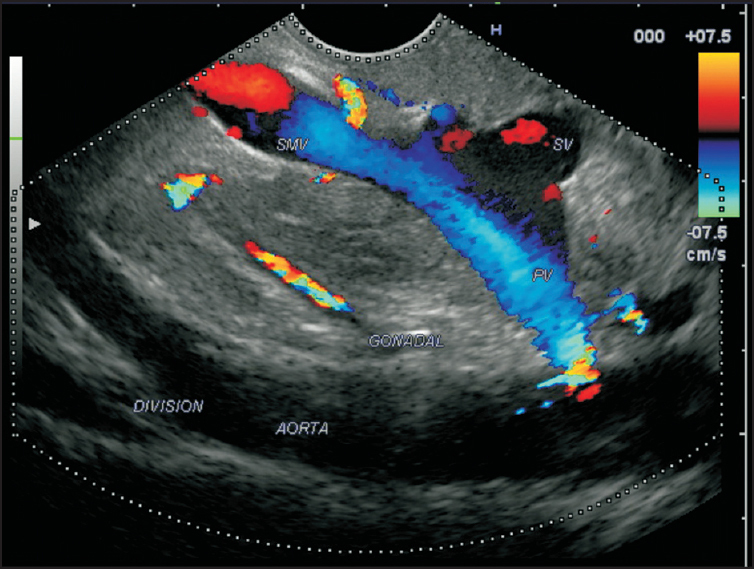 Usually an application of color Doppler over the anterior border of the aorta is required for locating the artery [Figure 25]. The imaging of this part of the aorta can be done from just beyond the esophagogastric junction near the posterior wall of the stomach or from the second/third part of the duodenum. The abdominal aorta beyond the origin of the celiac artery to the origin of the SMA can be traced from the stomach as well as from the second/third part of the duodenum [Figure 26]. a. Initially, the scope is negotiated into the third part of the duodenum. b. Slow pull out is done in a neutral position of the knobs. c. Slight clockwise and anticlockwise rotation helps in finding and following the SMA from below upwards up to the point of its origin from the aorta [Video 8]. 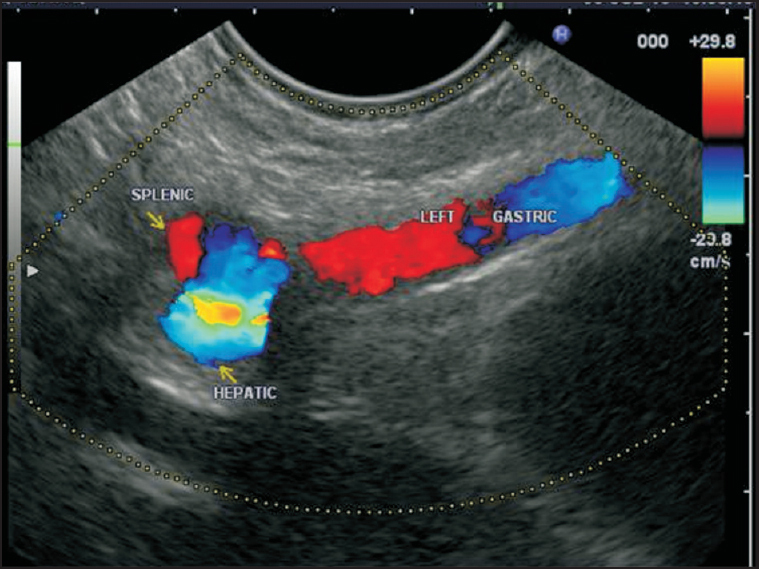 d. As an alternative method, pushing the scope down after locating the celiac artery from the stomach is able to locate the origin of the SMA fairly regularly. The superior mesenteric artery is identified by the presence of pancreatic tissue between the SMA and aorta in imaging from the stomach or duodenum. Slight clockwise and counterclockwise rotation at this level shows the origin of the right and left renal arteries also [Video 9] and [Figure 27]. The third part of aorta is crossed anteriorly by the third part of the duodenum and it is generally easier to image both the second and third parts of the abdominal aorta from second and third parts of the duodenum. a. The scope is positioned in the duodenum and shortened in such a manner that the aorta may lie in one of the three positions. b. The aorta may lie parallel, distal end close to the probe or proximal end close to the probe situation [Figure 27], [Figure 28], [Figure 29]. a. The branches of this segment include the renal arteries, the lumbar arteries, the gonadal artery and the inferior mesenteric artery before the bifurcation of the aorta [Figure 30], [Figure 31], [Figure 32] and [Video 10]. b. Clockwise and anticlockwise rotation from this position is able to demonstrate the branches coming out of the aorta and the bifurcation [Figure 33]. d. It is generally difficult to identify the inferior mesenteric artery in this position. e. Sometimes the origin of the gonadal arteries can be identified at this level [Figure 32] and [Video 12]. 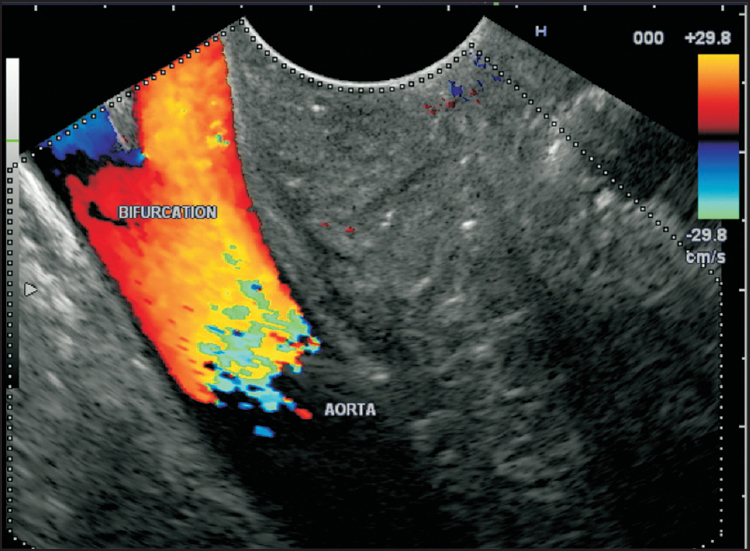 The bifurcation of the aorta can be traced from the rectosigmoid junction and also the DA can be followed-up for a limited distance above the bifurcation by rectal ultrasound [Figure 34] and [Video 13]. 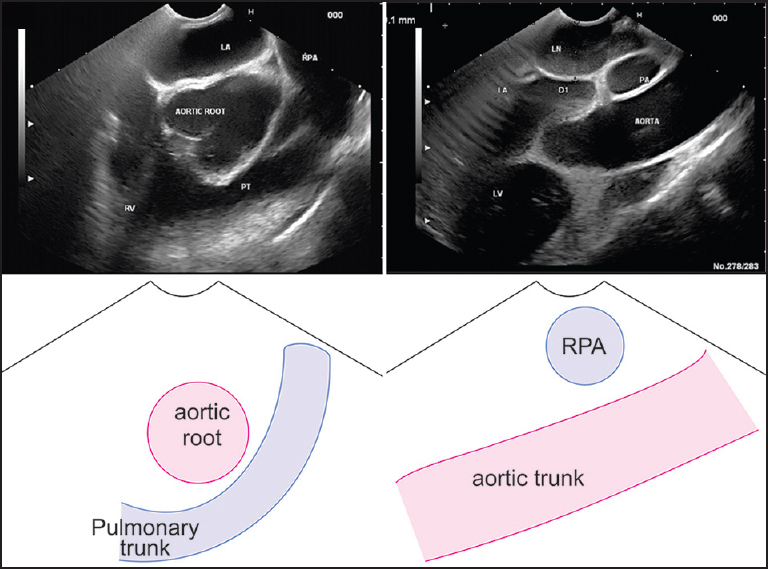 Endosonography can delineate the vascular anatomy of the aorta and its branches. The technique of imaging different parts of the aorta may be useful for beginners for proper orientation during EUS. Yamao K, Irisawa A, Inoue H, et al. Standard Imaging Techniques of endoscopic ultrasound-guided fine-needle aspiration using a curved linear array echoendoscope. Dig Endosc 2007;19:S180-205. Sharma M, Babu CS, Garg S, et al. 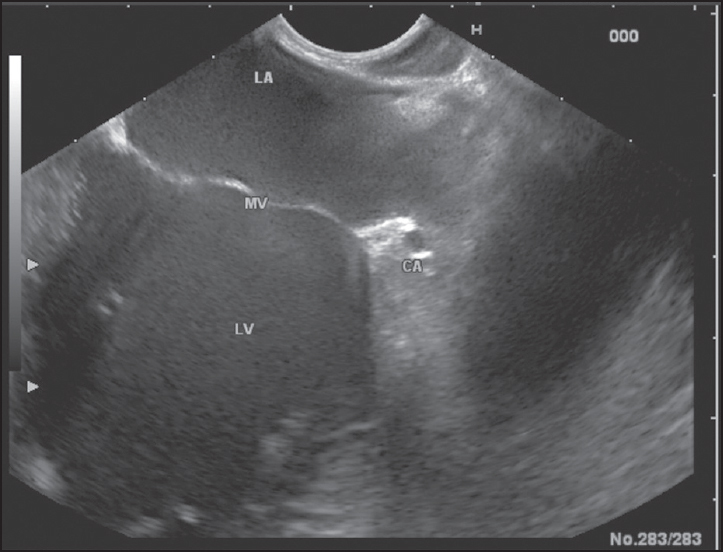 Portal venous system and its tributaries: A radial endosonographic assessment. 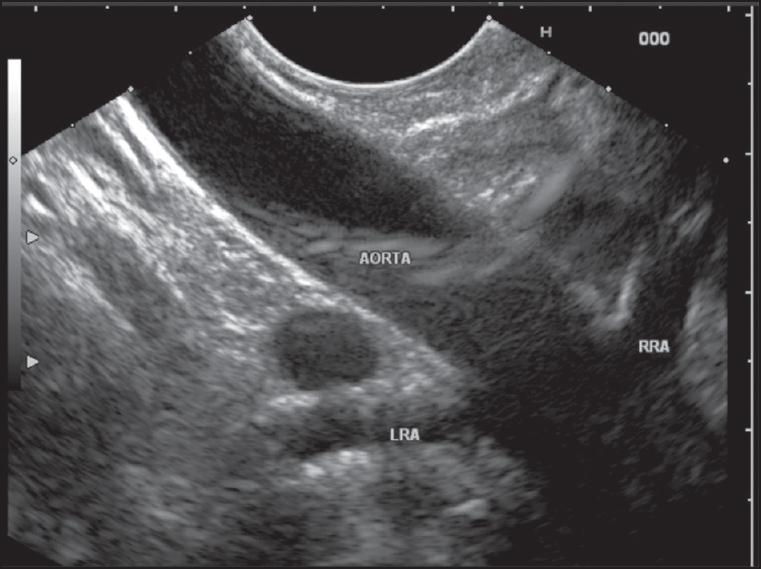 Endosc Ultrasound 2012;1:96-107. Sharma M, Rameshbabu CS, Mohan P. Standard techniques of imaging of IASLC borders by endoscopic ultrasound. J Bronchology Interv Pulmonol 2011;18:99-110. Sharma M, Arya CL, Somasundaram A, et al. 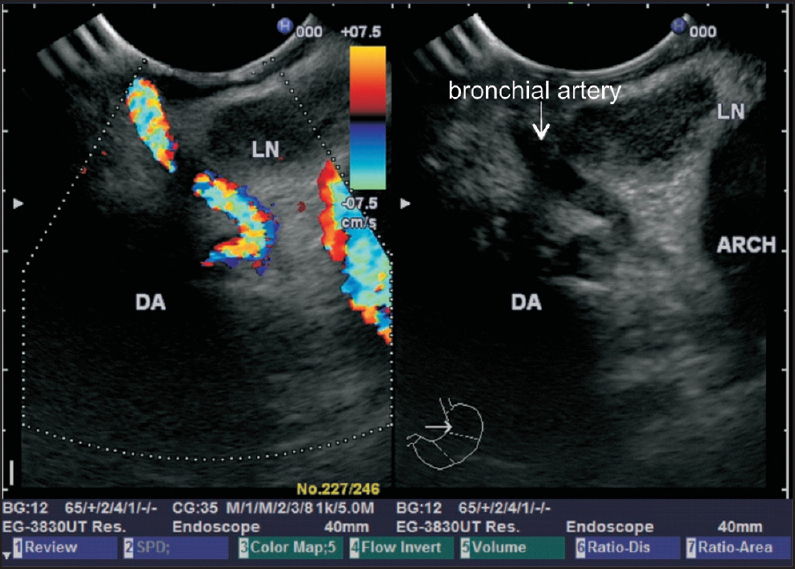 Techniques of linear endobronchial ultrasound imaging. J Bronchology Interv Pulmonol 2010;17:177-87. 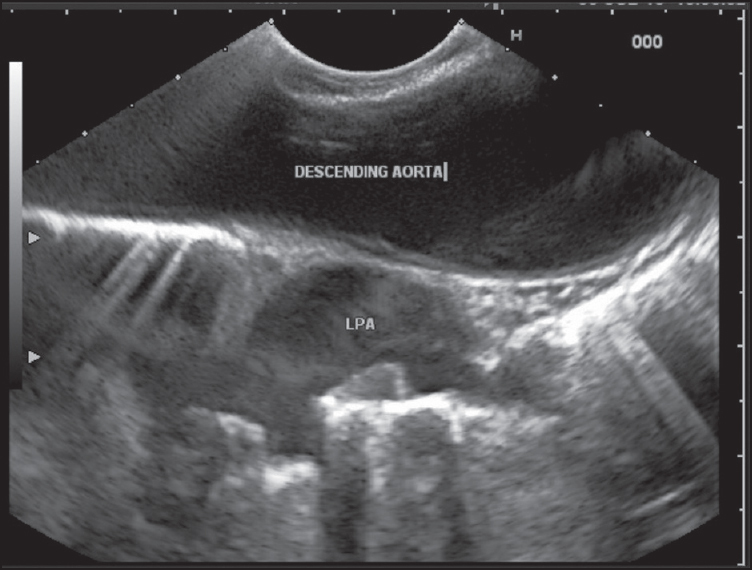 Sharma M, Chittapuram RS, Rai P. Endosonography of the normal mediastinum: The experts approach. Video Journal and Encyclopedia of GI Endoscopy 2013;1:56-59. Gotway MB, Helical CT. 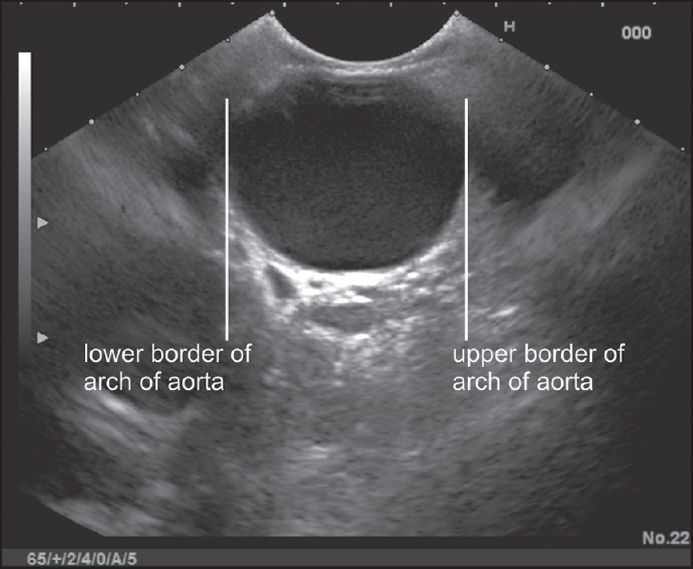 Evaluation of the thoracic aorta. Appl Radiol 2000;29. Hager A, Kaemmerer H, Rapp-Bernhardt U, et al. Diameters of the thoracic aorta throughout life as measured with helical computed tomography.0 J Thorac Cardiovasc Surg 2002;123:1060-6. Chuang ML, Gona P, Salton CJ, et al. Normal reference values for thoracic and abdominal aorta and main pulmonary artery dimensions by cardiovascular magnetic resonance: The Framingham Heart study. J Cardiovasc Magn Reson 2013;15 Suppl 1:256. Mao SS, Ahmadi N, Shah B, et al. Normal thoracic aorta diameter on cardiac computed tomography in healthy asymptomatic adults: Impact of age and gender. Acad Radiol 2008;15:827-34. Kaiser T, Kellenberger CJ, Albisetti M, et al. Normal values for aortic diameters in children and adolescents - assessment in vivo by contrast-enhanced CMR-angiography. J Cardiovasc Magn Reson 2008;10:56. Wanhainen A, Themudo R, Ahlström H, et al. Thoracic and abdominal aortic dimension in 70-year-old men and women - a population-based whole-body magnetic resonance imaging (MRI) study. J Vasc Surg 2008;47:504-12. Demertzis S, Hurni S, Stalder M, et al. Aortic arch morphometry in living humans. J Anat 2010;217:588-96. De Luca L, Bergman JJ, Tytgat GN, et al. 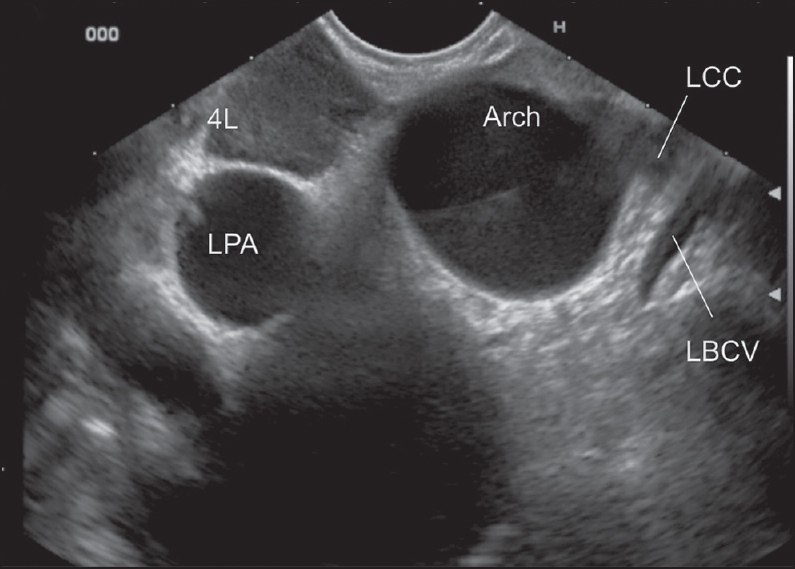 EUS imaging of the arteria lusoria: Case series and review. Gastrointest Endosc 2000;52:670-3. Yusuf TE, Levy MJ, Wiersema MJ, et al. Utility of endoscopic ultrasound in the diagnosis of aberrant right subclavian artery. J Gastroenterol Hepatol 2007;22:1717-21. Masri KR, Salyers WJ. Endoscopy ultrasound imaging of an abdominal aortic aneurysm. Kansas J Med 2010;5:70-2.